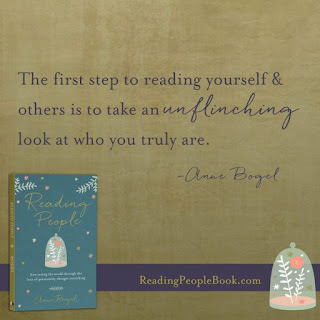 First of all, I have to confess to being a big fan of Anne Bogel's Modern Mrs. Darcy blog. 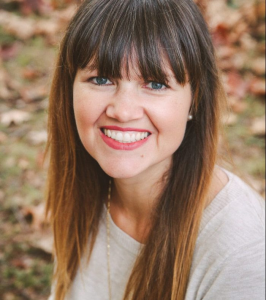 Because of her blog I was able to rekindle my love of reading fiction and re-discovered a piece of myself that I had lost in the chaos of parenting a half-dozen little ones. Now I will often say I feel most like myself when I have a good book to read. I appreciate Anne's presence on the internet so much and feel like she is a kindred spirit and an older sister. So when I heard that Anne was writing a new book I knew I'd read it, whatever it was about. 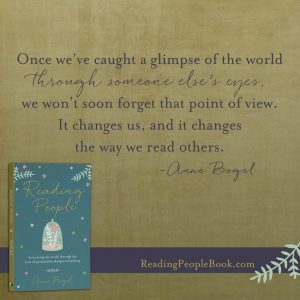 Then I heard that the title was "Reading People" and I heard about a "what type of reader are you?" quiz and for a minute I was confused about what her book might be about. 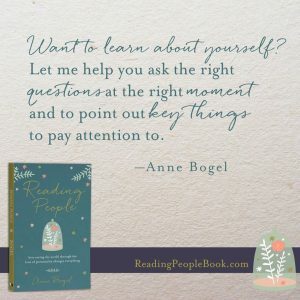 If you were confused too - let me clear it up: Anne Bogel's new book Reading People is a brief survey of her favorite personality frameworks. Like having a long conversation at your favorite coffee shop with your very smart (and slightly nerdy - in the best way possible) best friend, she shares the basics of each framework and, between stories about herself and her family, helps us understand why having a basic understanding of these personality frameworks has the potential to positively affect how we relate to people - both at home and at work, as well as to help us function more optimally ourselves. When my oldest was little, maybe two or three years old, we lived in a little duplex by the railroad tracks. Every morning, when she would wake up, she would ask "Can I go outside to play?" and every morning I would say "No baby, the grass is too wet to play." and every morning she would say "Can I go check?" and every morning I would get my feelings hurt by this. I would answer "No, I already told you, the grass is wet." Every morning I would get exasperated with her - did my daughter not trust me? Did she think I would lie about grass being wet? Did she think I was so stupid that I didn't understand the concept of dew? Around this time, I borrowed a book from my MOPs mentor about personality frameworks (this one was specifically about how personality impacts education) and one of the sections dealt with the difference between the "abstract" thinker and the "concrete" thinker. I am an "abstract" thinker - I am future-oriented and can easily grasp big-picture ideas (but lose details easily). My daughter is very much a "concrete" thinker. She is detail-oriented, very literal, and she likes to be able to "touch" what she is learning; to experience it for herself, or in other words, nothing is true in the mind of the concrete learner until they have discovered it to be true for themselves. This is terrific for scientists and researchers and all kinds of innovators, but it can be hard to parent at age three. This ongoing struggle with wet grass had nothing to do with respect or trust, this was just how my daughter processed information and perceived her world. The next morning my daughter woke up and asked "Can I go play outside?" I said "No baby, the grass is too wet." she whipped out her usual question, "Can I go check?" and this time I said "Sure." She went outside, touched the grass, came back in, and said "Yep, the grass is wet." I don't remember having this discussion ever again. One of the most important ways that I have grown as a parent has been trying to learn to understand my children. I have six and each one of them are unique (and constantly growing). They are each a one-of-a-kind combination of personality, preference, sensitivity and strengths. Trying to understand them is an ongoing study and every time I am able to have an "aha" moment about one or the other of my kids is a moment of achievement for me. Honestly, I don't have an enormous amount of time (or brain power) to read a lot of techincal books on personality. I wish I did, and I will occasionally check out a couple big fat ones from my local library but I usually fall asleep trying to read them. 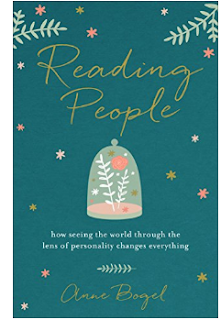 Reading People is just the kind of book to get our toes wet in the kiddie-pool area of the swimming pool of personality frameworks. 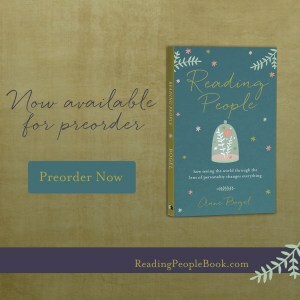 Reading People covers the topics of Introversion vs Extroversion, what it means to be a Highly Sensitive Person, the Five Love Languages, Myers-Briggs Types Indicator, MBTI Cognitive Functions, Strengths Finder, and the Enneagram. 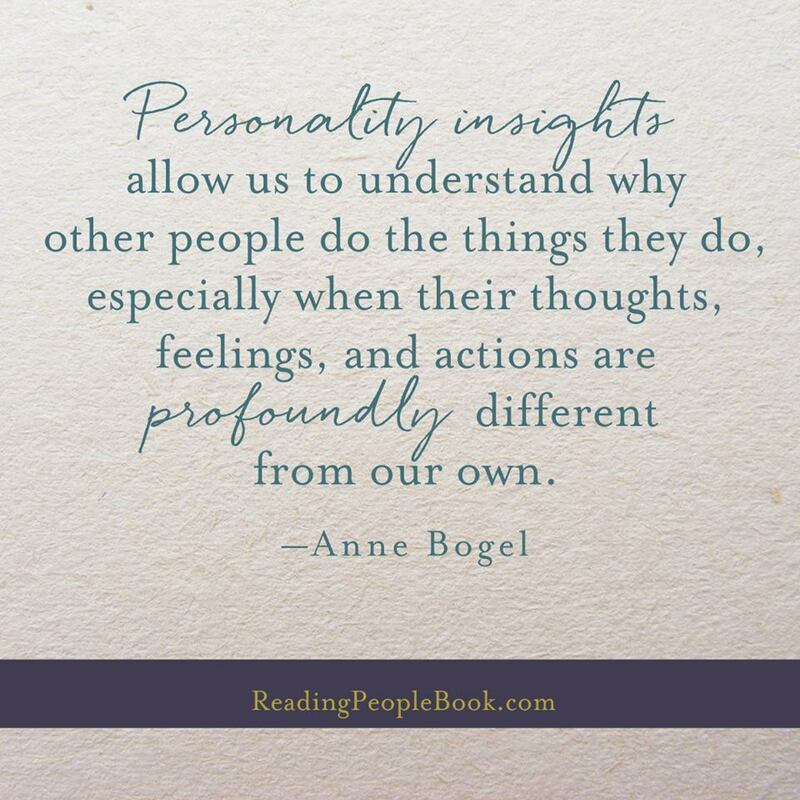 Anne Bogel writes that these personality frameworks are "tools for understanding why we do the things we do, why some things come easy while others are difficult" and that they "help us understand why other people do the things they do especially when their thoughts, feelings and actions in a given situation are profoundly different from our own." Each chapter gave me something to think about. 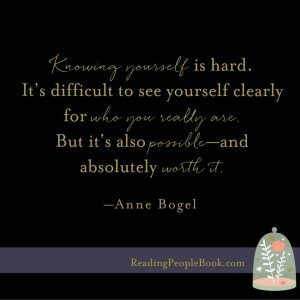 Anne also shares through the book about her experience with trying to understand herself better and the importance of being honest with ourselves. She writes "I made the mistake of answering the questions based on what I wanted to be like, not what I really was like... [or] I answered questions according to my learned behaviors, not according to my inborn preferences." Understanding these personality frameworks help us with understanding what we need "to feel like [our] best selves (ideally) or a functional human being (realistically)" This is one of my favorite quotes! It is so relatable. I just turned 34 last weekend and lately I have been surprised by some of the things I have been learning about myself. I thought I was self-accepting, I thought I had come to terms with the person I see in the mirror. Turns out I consistently see myself as who I want to be or wish I were and I keep bumping into the limits of what I can and can not do and still be a "functional human being". Learning my personality has been helping me understand who I really am and what I need to function optimally. One of the chapters I struggled with, surprisingly enough, was the chapter on love languages. My self-image in this area is that I am a low-maintenance gal. I don't like to admit that I have needs, wants or even preferences. But this past weekend, as I unwrapped my husband's gift I literally burst into tears. He upgraded my phone, something that I had been wanting but was positive it was something we would not be able to afford for awhile. Not only that he made sure that my phone was backed up and had it delivered before my birthday. It meant so much to me that he'd been planning this for weeks. For my husband it was gratifying for him to see that he was able to make me so happy. I don't want to admit it - but my love language is probably gift giving. Fighting this about myself and refusing to admit that this is my love language has kept me from being able to communicate to my husband about what I need from him in order to feel loved. There have been so many aha moments as I've been reading Reading People. 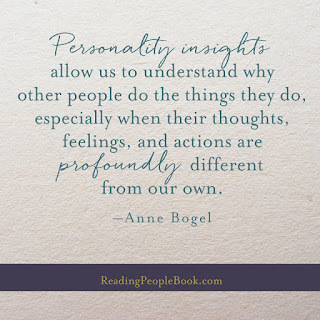 Especially while reading the chapter on the Myers-Briggs Type Indicator (MBTI) Cognitive Functions. I know it is a mouthful, and it did make my brain hurt a little bit, but this chapter is brilliant and it helped me discover more clearly what my Myers-Briggs Type is and even more than the what of my type I feel like I am starting to understand clearly the why of my type. This chapter also clarified why I feel the way I do about my Enneagram type. That is a whole other post for a whole other day. So there you go. I highly recommend this book. Unless you are super well-read in personality frameworks, then this might seem too basic for you - or maybe you will enjoy comparing notes? I don't know. I will be reading this book again for sure, especially as my youngest kids get older (I have no idea what personality type my youngest has. Is there a practically perfect in every way type? Oh that's right no. Every personality has it's strengths and it's weaknesses.) If you are a fan of the Myers-Briggs this might help you understand some of the psychology it is based on and help you understand your type a little bit better. If you don't know your MB personality type I think this book would definitely help you figure it out. Or if you kinda hate personality types (she addresses pretty much everything that made me once hate this particular type-sorter) there is still something to be learned in here and it is such an enjoyable read that I think you'll agree that whether you jump on the personality framework band-wagon or not you at least now know enough to engage in some small-talk on the topic. To learn more about the pre-order gifts available click here. I am thrilled to have been a part of Anne's Launch Team! This review is based on the electronic advanced reader copy that I received for the purpose of review. Some of the links in this post are Amazon affiliate links, thank you for supporting my blog! Honestly though, whether you request the books I review from your local library or borrow it from your friend I hope that I can help you find a good book. Because I don't know about you but I feel most like myself when I have a good book to read. If you are visiting from the Launch Team please let me know! Either in a comment below or on my Instagram, Facebook or Twitter pages. I am getting ready to publish my first book! If you'd like to learn more about it please click here. Want to chat more about personality type and how you can apply it to you day to day life? Check out my coaching page and request a free 30 minute call. What is my measure of failure? So what is up with this whole blogging thing?